I make no claim to authenticity but present this as an excellent all-in-one meal. If you’re cooking the rice from scratch you’ll need 300g raw rice to give the right amount. You can use all sorts of vegetables as long as you have at least three different ones, and some contrasting colour and texture. Some chopped ham and peeled prawns would also be good additions if you are cooking for meat-eaters. Beat the eggs and set aside. Put the wok on a high heat; leave till smoking. Add 1 tbsp oil, leave for 2 seconds, then add the shallot, garlic, ginger and chillies. Stir-fry for a few seconds, then add the carrots and green beans. Stir-fry for 2 minutes, then add the peas and cook for another 1–2 minutes. Scrape the contents of the wok into a bowl, then return the wok to the heat. Add the remaining oil, swirl it around, then stir-fry the eggs. Scramble them with a wooden chopstick until just set. Quickly add the rice and stir-fry, scraping in any egg that sticks to the sides, for a further 2–3 minutes to mix and heat through thoroughly. Return the vegetables to the pan with the tomatoes and bean sprouts, then season. 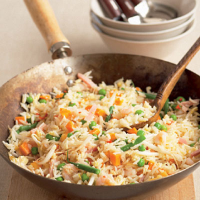 Stir-fry for 1–2 minutes and serve immediately.